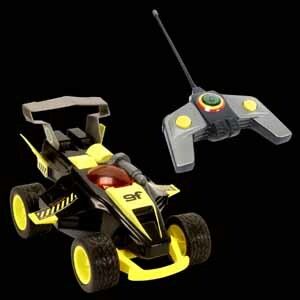 The Gyro Force RC Car is one of those toys that you are either going to find the most annoying radio controlled car, or the coolest to be launched onto the market. I went from one extreme and back again with this bizarre vehicle. First I thought it was one of the best cars on the market, then I became frustrated with it and, finally, I started to appreciate how clever the design was. I originally saw this at a toy fair months before it was launched. 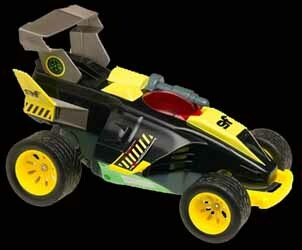 And, having being a huge fan of Feva's Crash Force Regenerator RC Car, I was really looking forward to getting my hands on the Gyro Force Car. When this arrived in the office I reminded (actually "begged" is probably a more accurate description) my reviews editor that I really should be the one to try it out. I plugged it in and then waited for the battery to charge. Once it was fully charged I inserted the battery in the car (no easy task - and it was even more problematic to take out) and set off to test it. Being a complete bloke, I knew what I was doing and didn't bother to read the instructions. That was, at it happens, a bit of a mistake. I switched the car on and listened as the gyro started up. It makes a hell of a noise and is certainly not the car to buy if your neighbours keep on at you to turn your music down. Then I tried to steer it... What?! All it seemed to do was go back and forwards. There wasn't much response from the left or right control. So, out came the instructions... maybe it was broken. Ah! It has skateboard steering. Hmmm... now what does that mean? I was totally flummoxed. It took a 14-year-old to show me what I should be doing. But, just as I was starting to get the hang of it the battery died. Twenty minutes of playing time isn't really enough and, unlike the Crash Force Regenerator, you don't have the option to insert disposable batteries. The next day, on a fully charged battery, I had another go. And this time I managed to get the car to jump and rotate in the air. The controls are pretty simple to use. You have your standard backwards and forwards, left and right (which spins the gyro one way or the other instead of turning the front wheels) and then there's a turbo button, which sends the car into convulsions. The batteries would probably last a lot longer if you could switch the gyro on and off from the remote control. It would have been a much better car if normal RC steering was included and a button that allowed you to turn the gyro on and off. This way, you could easily aim the car at the ramp, fire up the gyro and then race forwards and launch the car into space. Another problem is that this car, because it's constantly flipping over and landing on its roof, soon gets badly scratched. However, the design of this car is such that it allows (with tons of practice) to spin, back flip and do all kinds of fancy manoeuvres. And, with a lot of practice, you can get it to turn easily. At the end of the day, this car is great fun to play with. If you are prepared to persevere with the controls, and spend weeks perfecting your tricks, you'll have a great deal of fun.